The traditional Waterbag type pool cover has one benefit – it will block the sunlight so you don’t open your pool with a mess below the cover. Unfortunately, there will be a mess above the cover! We get the “when to open your swimming pool” question a lot, especially from new homeowners. What type of cover do you have? How long does a swimming pool liner last? Most liners last 10-12 years. If they are taken care of they will last a little longer. If they aren’t taken care of they will obviously not last as long. How often do I need pool water testing for proper balance? You should check your pool chemicals every day, especially the chlorine. If you miss a few days and the pool loses all the chlorine it may turn green. The pH and alkalinity should also be checked at least every other day. The alkalinity keeps the pH in the right range which helps the chlorine stay active and be able to kill all the nasty stuff in the water. This is especially true if you use the TriChlor tabs (hockey pucks). They have a pH around 3,so they will constantly bring your pH and alkalinity down. The Calcium Hardness can be checked every month or so. This level will change if you have a leak and are losing a lot of water or if you use Calcium Hypochlorite. The stabilizer should be checked once a month or so. More frequently if you have a leak or a lot of splash-out. You should check for Phosphates fairly frequently as well. Phosphates act as food for algae. so if you’re having recurring algae blooms, you might want to bring some water in for testing. We will be writing a blog post on this subject shortly. There are a few different ways to test the chemistry. There are dip and read test strips. These are handy, but not terribly precise. But will give you a general range. Taylor and AquaCheck have a few options for these test strips. Don’t use wet hands to take out the test strip and make sure that you cap the bottle tightly, you don’t want any moisture getting in. There is the small “economy” liquid test kit. This kit just tests for chlorine and pH. There is a range of other liquid test kits from the ones that we use as swimming pool professionals, to one that’s not quite that elaborate but will work for your pool. If you leave the liquid reagents in the shed over the winter, throw them out, they’re not good. Also, in most cases the liquid reagents last only a year from the date you open them. If you have a commercial pool, the local and state health department will advise you about how often you should check the water balance. Also, you are required to use a DPD test kit for water testing. Come in or call us if you have questions regarding your pool water chemistry or your water testing kit. We also test water at no charge at our location at 91 Prestige Park Circle, East Hartford CT.
Why isn’t my manual pool vacuuming unit working? We get this call a lot. The first question we ask is how old is the pool vacuuming vac hose? Lots of times its old and has an air hole in it so it’s not maintaining prime. The hose gets dragged along with ground, so it’s worn out. Get a new hose and you’ll be all set. Other times the hose is installed backwards. 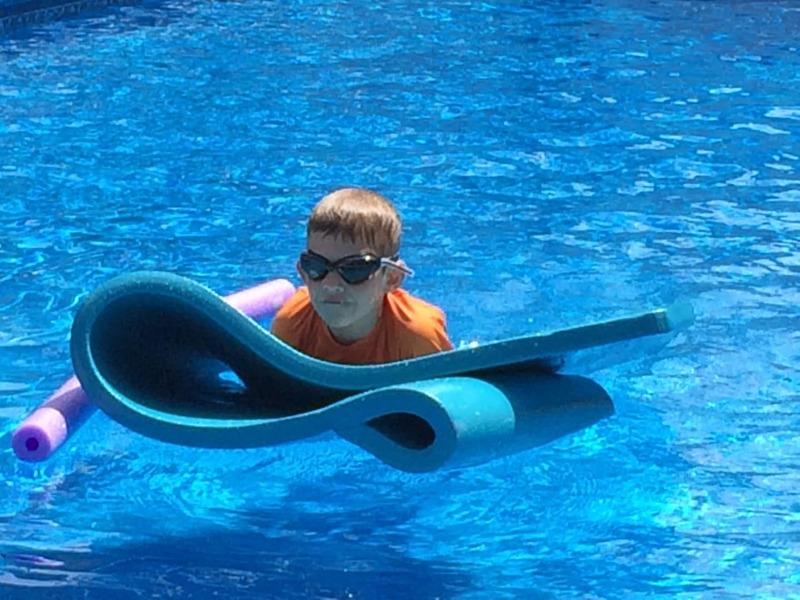 The swivel end goes on the vac head in to the pool and the non-swivel end goes onto the skim vac plate. If you have a new hose and the right end is in the pool and it’s still not working, you may need to backwash the filter or clean your cartridge(s) or DE Grids. You may need to degrease your DE grids or cartridges, not just hose them off. What’s a skim vac plate? It’s a device that fits on the stationary end of the hose and goes over the skimmer basket so all the debris is collected by the skimmer. We don’t advise taking the end of the vacuum hose and placing it in to the hole at the bottom of the skimmer and letting the pump basket collect the debris. It’s more of a pain to clean out and the impeller can get clogged with debris and you’ll have poor suction. We have all of the products you need to vacuum your pool at Savol Pools. We have vacuum hoses, vacuum heads for concrete or vinyl, skim vac plates and telescopic poles. Not liking the thought of having to vacuum manually? Call Savol Pools to discuss a robotic vacuum cleaner for your pool.